Dentures problem? Having multiple missing teeth can have a significant negative impact on a patient's quality of life. We need our teeth in order to function properly and to feel good about ourselves. When a patient has missing teeth, a partial or complete denture can serve as a wonderful restorative solution. The two common types of dentures are partial dentures and complete dentures. Partial dentures are ideal for patients with one or more missing teeth. They attach to a section of the patient's gum line to stay in place. Complete dentures are ideal for patients missing all of their teeth. They are removable, and also secure to the patient's gum line on both the upper and lower jaw. Dentures are created to perfectly fit a patient's unique mouth shape. The dentist will take impressions or molds of the patient's jaw and will send this to a laboratory so that the dentures can be properly manufactured. 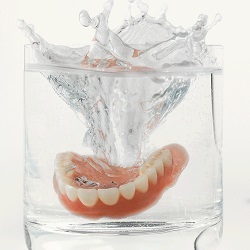 Dentures require that the patient look after them and clean them daily, just like they would their natural teeth. Interested in restoring your smile with dentures? Contact our Guelph dentist today. Please call our Guelph Dental office during regular hours on 519-824-8000, our staff will be happy to guide you through what to do in case of a dental emergency.